Every April, visitors to Old Havana’s historical centre will find squares, parks, streets, museums and old houses possessed by a dancing spirit. And it was this spirit invoked by dancer and choreographer Isabel Bustos and her company Retazos, which turns balconies, windows, stairs and walls into stages for the International Dance Festival. 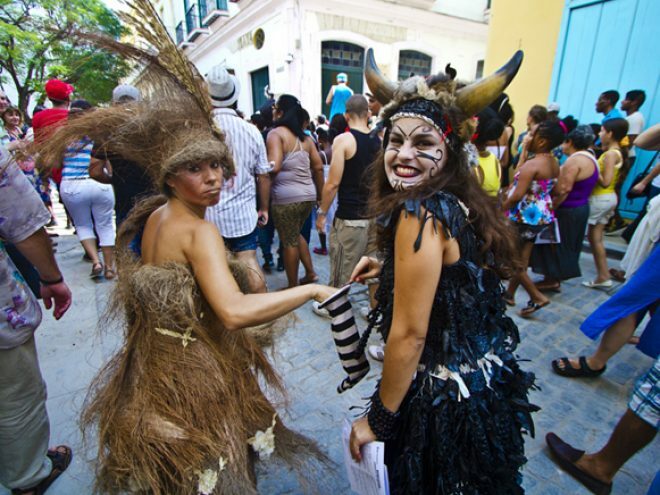 This absolutely unique dance festival began in 1996 in two or three house-museums in the Historical Center of Havana. In the words of Isabel Bustos, it started with “five or six people who ran from house to house, from balcony to balcony, from courtyard to courtyard, from garden to garden, two dancers here, two there.” Since then, it has gradually taken over almost all of the institutions run by the Office of the Historian as well as the main squares and streets in all the ancient parts of the city. The premise behind the International Dance Festival is to draw inspiration from the city’s architecture, to awaken the imagination, to promote new creative environments and to encourage the exchange of ideas and artistic experiences between the people of different languages and cultures. The invitation goes out from the Retazos Company which is directed by Isabel Bustos. Hundreds of Cubans and foreign visitors attend, fascinated by this opportunity to translate into movement the sensations and emotions that are awakened by the beauty of the splendid Havana architecture. For this year’s festival expect Old Havana’s plazas and streets to be filled with over 1,500 participants that include dancers, choreographers, musicians and painters from all over the world. Part of the International City Dance Network established in Barcelona this is a real cultural highlight in the beating heart of Old Havana, which should not be missed. Hundreds of dancers, artists and choreographers from Argentina, Austria, Brazil, Canada, Chile, Cuba, Spain, France, Mexico and Venezuela will take part in the event. Meetings, exhibitions, lectures, video-dance showings and passacaglias will take place during the mornings, while master classes, passacaglias and workshops will be held in the afternoons. The evenings have been reserved for shows. The principal stages will be Plaza de Armas, Plaza de San Francisco de Asís, Plaza Vieja; Rumiñahui, Simón Bolívar and Las Carolinas Parks; Galería Oswaldo Guayasamín, Casa Benito Juárez, Casa Simón Bolívar, Casa de la Poesía, Factoría Habana, Vitrina de Valonia, Las Carolinas Theater and the streets of Mercaderes, Oficios, Amargura and Obrapía. www.danzateatroretazos.cu April 2014 This article formed part of the April 2014 issue of What’s On Havana The definitive monthly travel & culture guide to Havana Download our current issue of What’s On Havana, your definitive travel, culture and entertainment guide for all things happening in Havana, Cuba’s bustling and enigmatic capital city. We include features from around Cuba written by the best international travel writers covering Cuba. Our monthly online digital magazine is also available in Spanish and French.